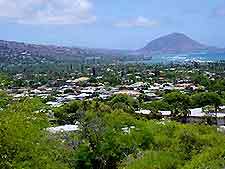 With great road access and public transportation around Hawaii's small island of Oahu, getting around the myriad of attractions nearby Honolulu is easy. 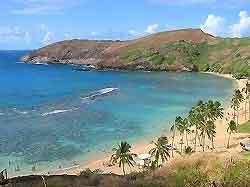 Climb to the top of nearby Diamond Head, snorkel on the beautiful Hanauma Bay farther to the east or head north to catch some surf at the famous Waimea Bay. 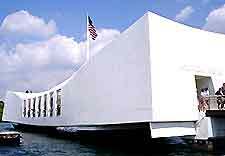 Attractions closer to the city are also numerous and varied and include the unforgettable Pearl Harbor and its memorials. Lying to the southeast of Honolulu, Diamond Head is an extinct volcanic peak offering amazing views over the ocean and city below. You can walk to the top along an established trail that takes you through a tunnel, up a spiral staircase and four flights of steps. This beautiful horseshoe bay is Oahu's best snorkeling destination. The beach and crystal clear waters are excellent for sunbathing and swimming. There is also a visitor center here covering marine life and safety information on tides and the area. 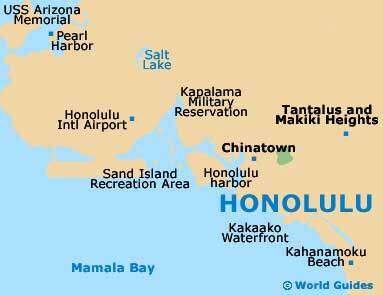 Located at the Pearl Harbor Naval Base to the northwest of Honolulu and originally named for its stocks of pearl oysters, Pearl Harbor was the unfortunate target of Japanese bombers in 1941, a move which ultimately brought the Americans into WWII. Within the harbor are the USS Arizona Memorial and a visitor's center featuring a museum and theater. In commemoration of the sailors who were killed during the Japanese attack on Pearl Harbor in 1941, the USS Arizona Memorial is a fitting reminder of the sunken vessel that claimed so many lives during the war. The memorial itself floats over the great ship. Situated to the northeast of Honolulu and Diamond Head on Oahu's eastern shore, Kailua Beach Park is a haven for windsurfers due to the stiff, constant breeze and the gently sloping sands. The beach park contains a number of basic facilities, including equipment hire. The best time to visit Kailua Beach Park is during the week, when it is quieter. Located just to the north of Kailua Beach Park on Kaneohe Bay, Kualoa Regional Park is perfect for picnicking, with its wide open grassy expanses and narrow beach, which is safe to swim at year-round. Basic amenities, apart from refreshments, are available here. Waimea Bay lies on Oahu's north shore and is famed for its huge winter surf, being popularized by the Beach Boys in 'Surfin' USA'. This exquisite one-kilometer long sandy beach is backed by the shady trees of the Waimea Bay Beach Park, with its picnic tables and surfing facilities. If you are here for the bathing, summer is the best time to visit Waimea Bay, when snorkeling and swimming conditions are perfect. Located within a hour north of Honolulu, the emphasis of the Polynesian Cultural Center is to educate visitors about the culture and heritage of the Polynesian people. The site covers 42-acres with villages that tourists can tour and learn about traditions by talking to the village people and observing and taking part in activities. The center also provides day packages that include tours of the island, dining and an evening show.